Intel recently announced the Celeron processor - a low cost version of the Pentuim II without any level 2 cache. This makes it a very low cost CPU pefect for low cost systems. The Celeron is probably one of the most overclockable CPUs available today. It has been confirmed by multiple sources that a 266MHz Celeron can run at 448MHz without any stability issues. 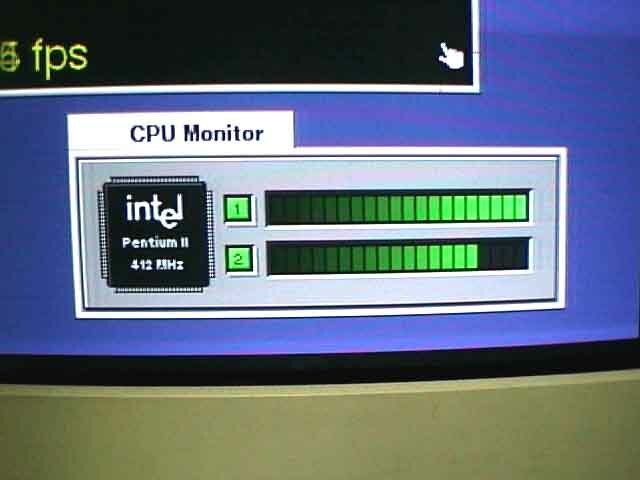 This is because of the fact that the Celeron has no L2 cache - on a Pentium II, as you increase the core speed, the speed of the L2 cache increases, and the L2 cache was not designed to operate at such high speeds. However, on a Celeron, there is no L2 cache to hold the CPU back. The Pentuim II, as we all know, can be run in a dual CPU configuration. 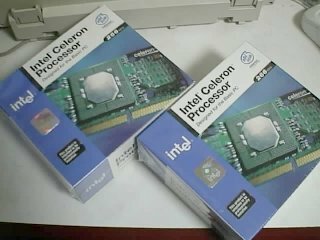 Since the CPU core of Celeron is the same as Pentuim II, I thought that I could use this good cost/performance CPU in a dual configuration. The first problem when we try to use Celeron in a dual configuration is that on the Celeron, BR1# is not connected from the CPU core to CPU board. That signal line is necessary for the CPU to operate in a dual configuration. 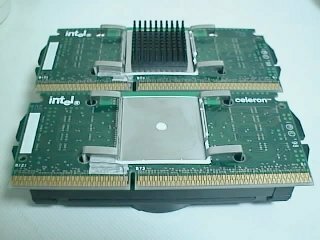 Through further invesitgation of a datasheet on Intel's web page, the pin assignment of the Celeron is the same as the Pentium II except 66#/100#, which decides the base clock. 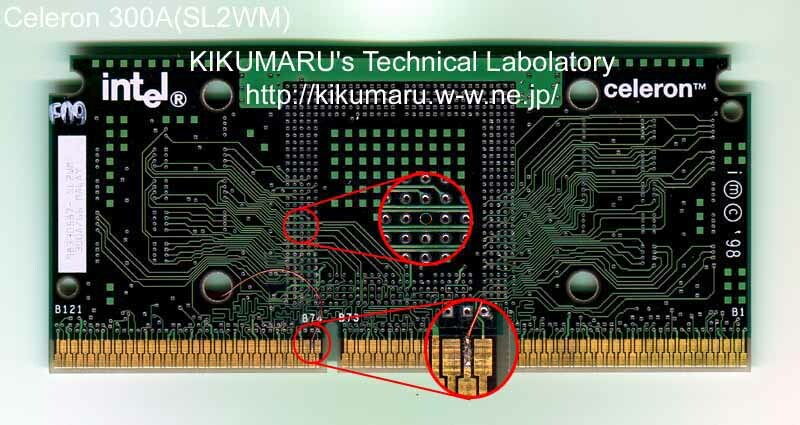 By connecting the BR1# signal line to the land of B75 on the CPU card edge, we can assume that the Celeron may operate in a dual configuration. Now that we have a goal, we went out and purchased a dual Slot 1 motherboard, and two Celerons (retail package SL2QG). It is hard to buy the Celeron in Japan, because in most shops they are still sold out. The 1st one I bought in the middle of May, and the second I bought at the beginning of June. The two Celerons have different production dates. The 1st one was produced 5/1/98, and the 2nd one was produced 5/15/98. Fortunately, both Celerons can operate easily at 412MHz. 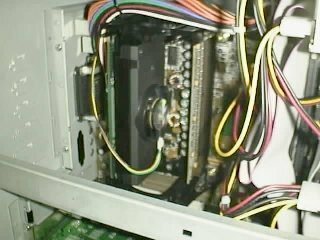 Before altering the processors, I installed the 2 Celerons in the motherboard and turned the power on. The result was negative: the computer did not even POST. First, we prepare the wiring. 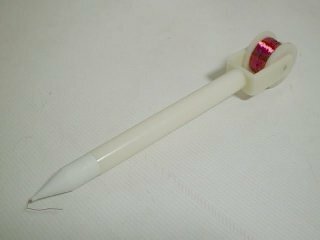 We use 0.26mm JUNFLON narrow wire which looks quite narrow. 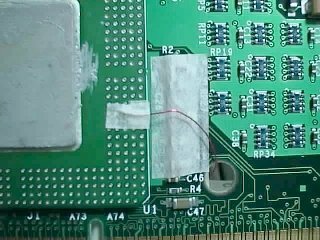 Using this wire we connected BR1# in the CPU core to B75 on the board. 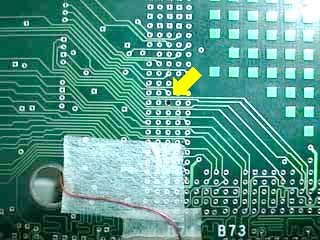 Unfortunately, this 0.26mm wire is so thick that breaks or slides out when the Celeron is installed into the motherboard. So, we need to find even narrower wire. 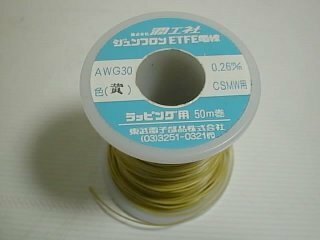 We use the even narrower wire bought in an Akihabara shop named Sengoku. I forget the real name of the wire. Now with the narrower wire we reconnect the CPU core and board. There is no break or sliding out when the Celeron is installed into the slot. It should be OK.
As you can see in the upper photograph, the wiring is very tight. If just a little slip happens, the wire could stick to the next land (which could cause serious problems). To prevent this, we cover the area around B75 with masking tape. 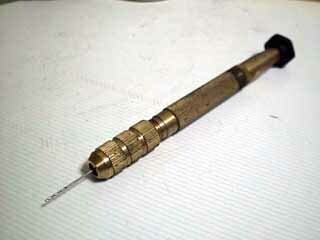 Then we start soldering. 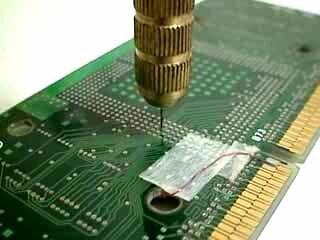 The wire is coated with insulation, but to make sure that the wire is not shorted to another pin, we mask the board also. After checking carefully for any short, we replace the fan and heat sink, and the alteration is complete. The 2nd Celeron is then altered the same way as the first. At first, just to be sure that the altered Celerons operate normally, we install them one by one and boot. It looks like they're operating fine. After making sure that the altered Celerons do not have any problems, we now try dual operation. Result is negative. The computer does not even POST, like before. We rechecked the wiring of the altered Celeron, and there seemed to be no problem. The wire does not short to other lines, and the contact looks right. So, we boot again with one Celeron, and there's still no problem. Just to test, we removed the wire from only one Celeron, and booted dual again. It's looks OK. It boots with no problem. The joy is short-lived however, as the motherboard only recognizes a single processor. 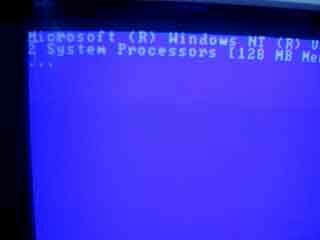 Next, we checked the voltage of BR1# while the Celeron was operating. 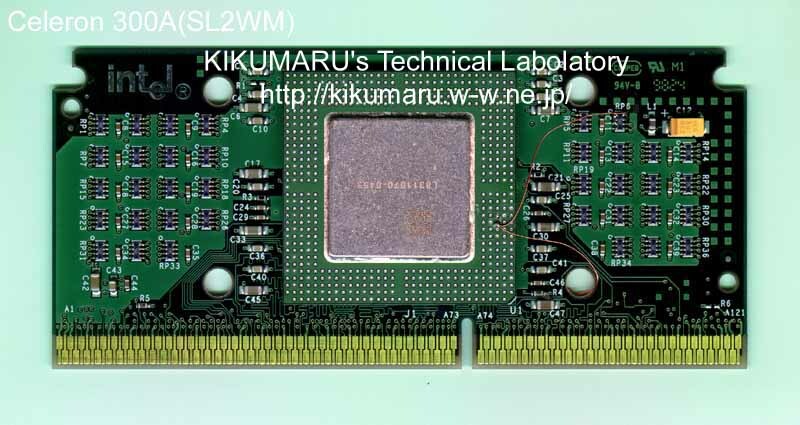 According to the data sheet of Pentium II, BR0# is GTL+I/O and BR1# is GTL+Input, and both pins are increased by 1.5V. 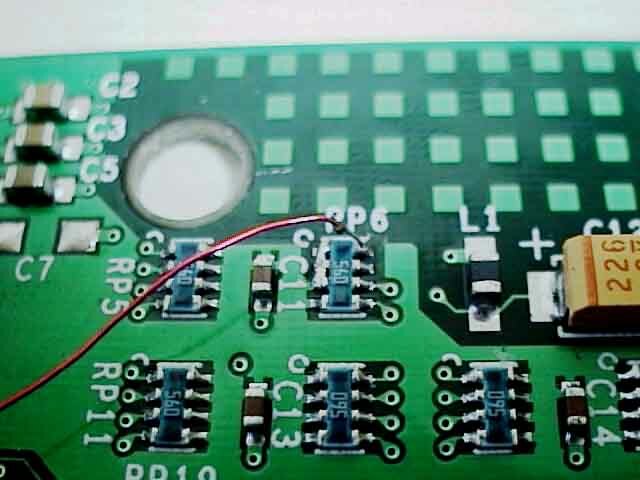 And now checking, BR0# is supplied with 1.5V of power, but BR1# is always being supplied 2.0V. 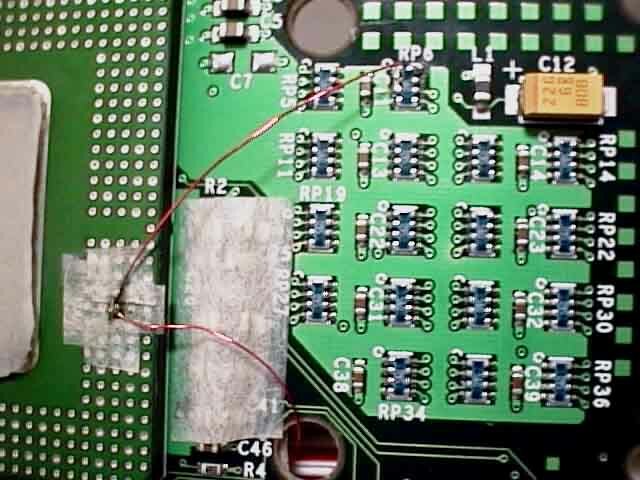 Though this voltage looks a little high, we cannot check the pattern from the surface of the board to BR1#, I suppose the voltage of this pin may be increased in the middle of the board. For dual operation we have to solve the problem with BR1# being supplied with 2.0V of power. 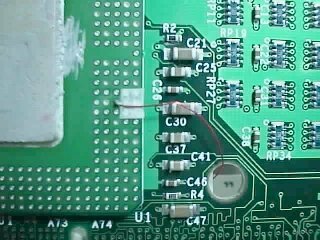 For some time we traced the pattern of the Celeron board, and measured the voltage at various points, but we couldn't find a good idea. Finally we decided to use a really violent way. It was actually pretty easy - we just cut the 2.0 voltage to BR1# which may be connected to VCC-CORE. 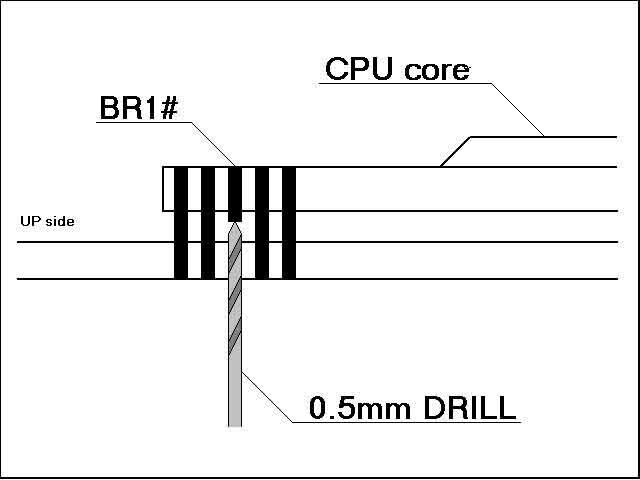 Using a 0.5mm drill, we shave the BR1# of CPU from the reverse side of the board, until it does not touch to the board. Continue to shave only a little beyond the thickness of the board. After shaving we removed the waste by using an air duster or something similar. We drilled another Celeron the same way. And the 2.0 voltage supply which was a problem has gone away. We reinstalled the altered Celeron to the motherboard for confirmation. Then we measured the voltage of BR1#. If BR1# is 0V, the alteration was successful. But with the above alteration, the Celeron will not work as a dual CPU. 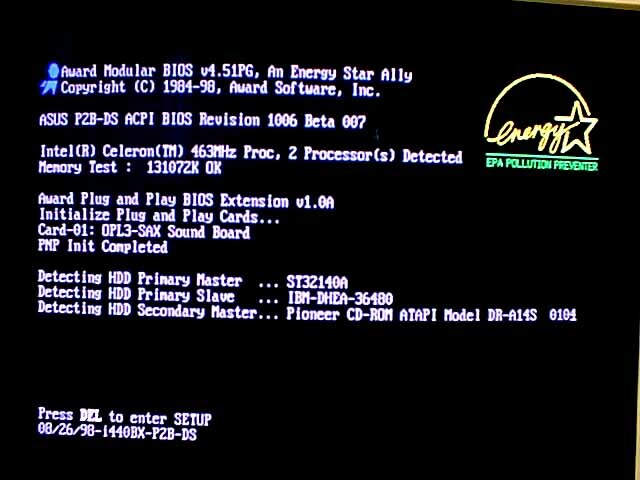 According to the data sheet of the Pentium II, BR1# is GTL+Input. So it will decide 'H' or 'L' by 1.5V as a standard voltage. So now BR#1 has to be increased to 1.5V. 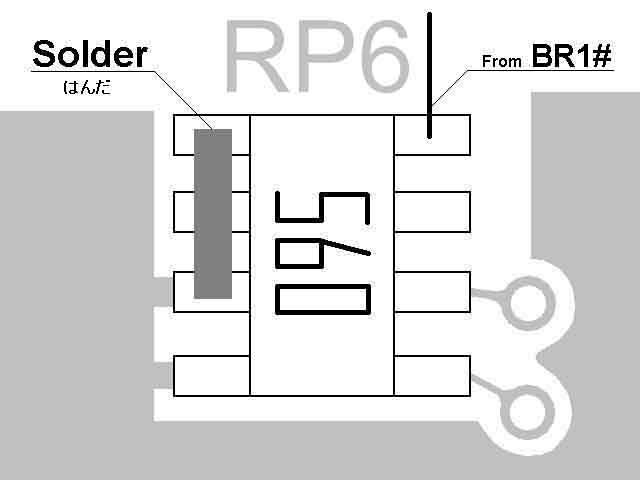 The top 2 pins of RP6 on the Celeron board are free, so we connect from here to get a 1.5V increase. 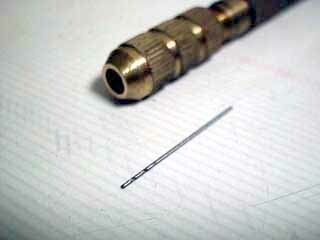 It is easier to connect from the topmost pin. Lastly, we carefully checked the jumper line for a short or lose solders. If there is no problem, the alteration is over. Now, we insert both Celerons and power on the system. BIOS recognizes the Celerons as 2 Processors! 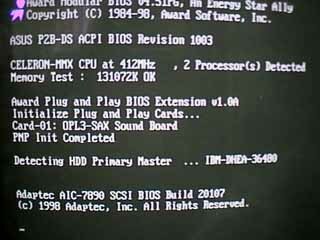 If the system will not boot here, or the system recognizes only 1 processor, you may need to recheck the wiring. Perhaps the wire is worn or was pulled out of the connector in the slot. 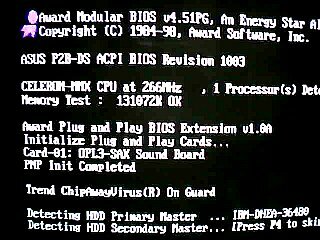 When even a single processor does not boot, the Celeron may not be correctly installed in the slot. 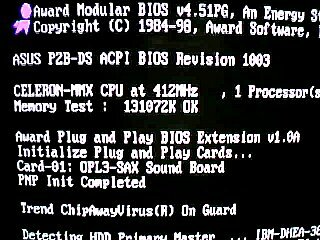 On July 25, we confirmed the dual Celeron operation on BeOS R3.1. This is a screen shot at that time. 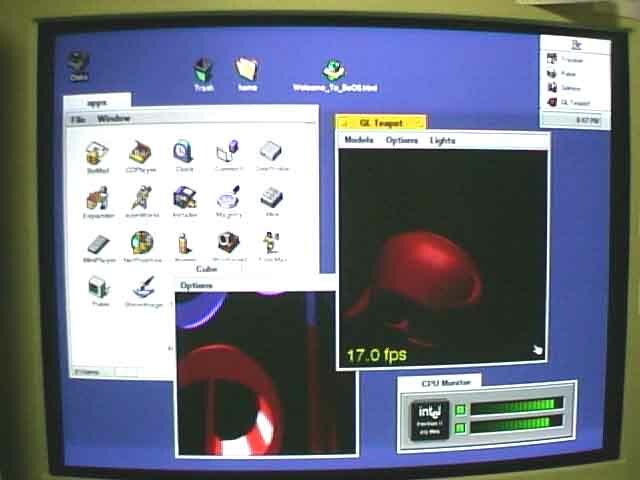 BeOS R3.1 Dual Celerons runnning! 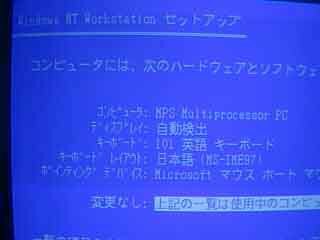 We also confirmed dual operation on Windows NT 4.0J Workstation. There is no strange behavior. 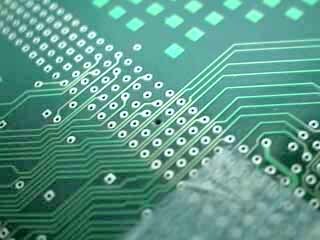 This alternation is dangerous and it could physically destroy your CPU. If you try to do this alteration, you're own your own - CPU-Central bears no responsibility for any damage caused to your CPU. 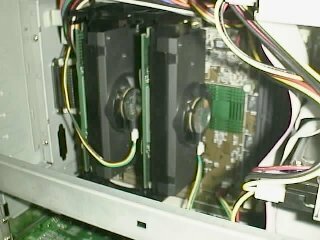 Many people have also been able to run a Pentium II along with a Celeron in a Dual Processor motherboard - stay tuned to CPU-Central for more information on this. Intel's new Celeron 300A (300MHz Celeron processor with 128kb of fully integrated L2 cache) is also able to work in a dual system by performing these modifications! Click here for Dual Celeron Benchmarks.